If your son or daughter is sitting down at breakfast right now, with a big Shrek glass full of orange juice, then you might want to take it from them. Those cute little painted-on Shrek designs just might be fatal! McDonald’s is recalling four glasses promoting the movie Shrek Forever After thanks to testing that revealed that the collectible glasses are contaminated with cadmium, a carcinogenic metal. It can also cause bone softening and kidney problems. 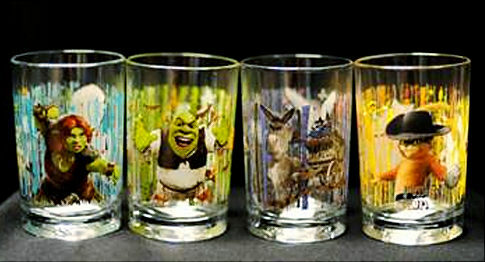 The 16-ounce glasses were selling for $2 a piece and feature four characters from the beloved Shrek franchise: Shrek, Fiona, Puss-In-Boots, and Donkey. McDonald’s says that the paint contains low levels of cadmium that could rub off onto children’s hands and then get into the body. An estimated 12 million glasses are being recalled; no word on how many of those have gotten into the hands of consumers (or if they’ve sold 12 million). I don’t know what’s more dangerous these days, food or the containers you eat it out of!